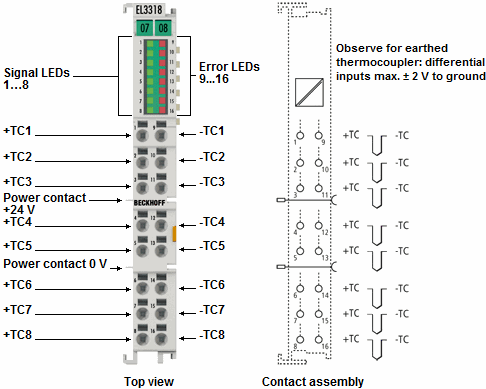 The EL3318 analog input terminal allows eight thermocouples to be connected directly and is thus particularly suitable for space-saving use in control cabinets. The EtherCAT Terminal circuit can operate thermocouple sensors using the 2-wire technique. A microprocessor handles linearisation across the whole temperature range, which is freely selectable. The error LEDs indicate a broken wire. Compensation for the cold junction is made through an internal temperature measurement at the terminal. The EL3318 can also be used for mV measurement.